This one cool casino, they look totally epic with a cool black and yellow design and have a distinct style that helps create a relaxed and fun gaming environment for their players. The casino holds a UK license and offers fair games from leading providers including NetEnt, Microgaming and NetEnt. They are instant play and have an excellent well-stocked mobile casino you so can play when and where you want. Shadow Bet Casino also happen to have one of the coolest loyalty schemes around. Their ‘Shadow Treasures’ (a bit cheesy but stick with us) offers unique rewards, free spins and cash as you progress through the levels. Earn experience points and level up as you play your favourite casino games. You’ll start life as a ‘New One’, move on to ‘Playmate’ (not the kind you’re thinking of!) and eventually work your way up to ‘Ninja’ status. Enjoy a wide variety of leading slot games at Shadow Bet Casino. 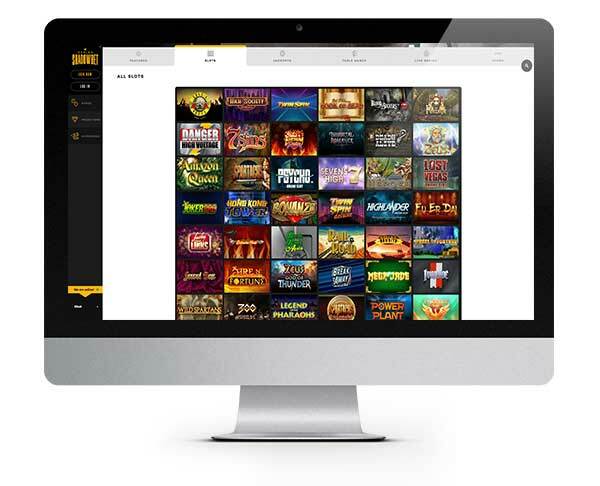 Players will find world-class slots from Microgaming, NetEnt and Betsoft. Some of our current favourites include Boom Brothers, Thunderstruck II, Motorhead, Superman, Jack and the Beanstalk, Gonzo’s Quest, Blood Suckers and Immortal Romance. If you can’t resist a spin on the jackpots, then Shadow Bet has over 20 in store for you! Enjoy big name progressive jackpot slots including Mega Fortune, Arabian Nights, Mega Moolah and Hall of Gods. Take a break from the slots (yeah right! ), and you can enjoy several table games including popular versions of blackjack, roulette and poker. There are also live casino games where you can enjoy live dealer blackjack and roulette 24-hours a day. Depositing at Shadow Bet is super simple and totally secure thanks to their SSL digital encryption technology. This keeps your financial and personal data safe from hackers. They only accept payments from trusted payment providers! Deposit using any of these secure methods: Visa, MasterCard, Neteller, Skrill, Trustly and Euteller. Euros, British Pounds, Australian Dollars and Polish Zloty. Shadow Bet Casino are registered in Malta and licensed by the UK Gambling Commission, license number 039575-R-319439-002. Shadow Bet customer support is available via live chat and email. Live chat is available Monday through Friday from 8:30 am – 4:30 pm. They don’t work weekends (lucky them) so you’ll be on your own until Monday morning. This epic welcome bonus from Shadow Bet is not to be missed. Not only will you get up to 10 Free Spins with No Deposit (see below for more details), you’ll also get a big welcome bonus. Don’t let this incredible deal slip through your fingers. Free spins with no deposit on sign-up plus extra bonus spins and cash on deposit. 100 Extra Spins on ‘Book of Dead’. (20 daily for 5 days in a row)! Shadow Bet are one of the best online casinos around and they have the greatest extra spins offer available today, so check it out before it’s too late!